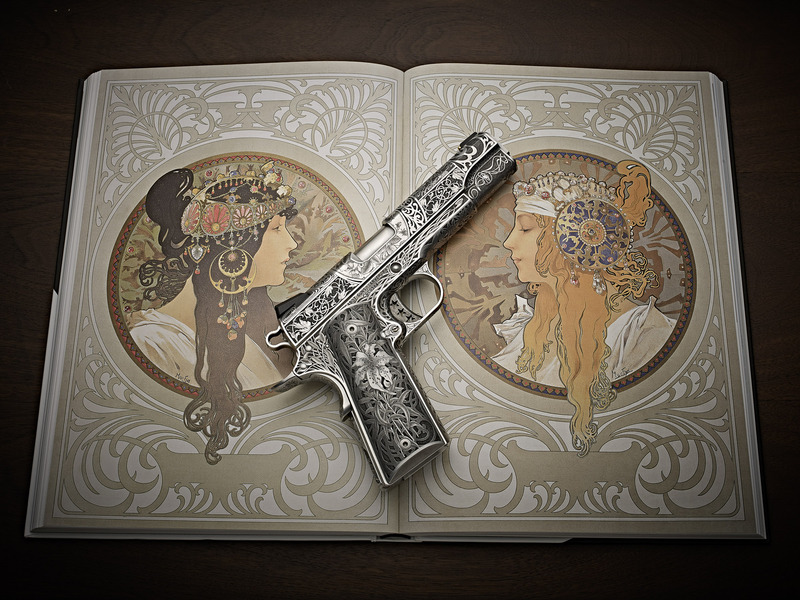 When Cabot Guns asked FEGA Master Engraver Otto Carter to create his next one-of-a-kind Masterpiece, the Art Nouveau style was the answer. As a longtime student of art history, Art Nouveau, the style always had a special place in Otto’s heart. The Art Nouveau style is characterized by highly stylized borders and repetitive -yet varied – design elements that keep the eye engaged in a continuous game of discovery with a surprise around every corner. Classic Art Nouveau artists (Alphonse Mucha, William Morris, Louis Comfort Tiffany, et al) did not work exclusively in the medium of engraving, and like all mediums, metal carries its own set of limitations related to color palettes. Rather than relying on color to bring out the vignettes of motifs that typically define the Art Nouveau style, Master Engraver Carter delicately created textures that create contrast between the segmented areas. A variety of techniques including bulino, as well as low and high relief carving, were also employed. The design strategy employed by Carter involved segmenting the pistols into interestingly shaped panels, each filled with different but related designs and textures. The design theme and panels create the illusion of perpetual motion as the gun is handled and turned, a technique and presentation inspired by the Aesthetic Movement. Unique scrollwork is a foundational part of Otto’s work, and this piece is no exception. 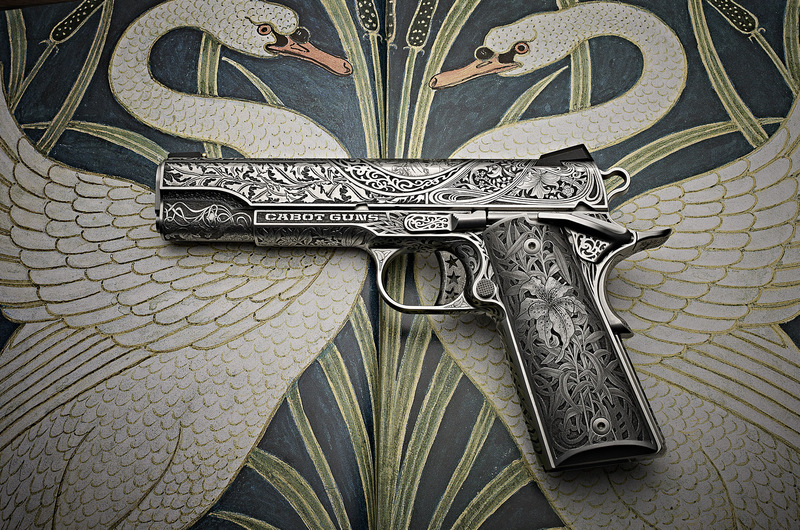 While traditional scrollwork keeps to a very tight, patterned repetition the Art Nouveau scrollwork on the Cabot Le Nouveau pistol relies more on nature for inspiration. It’s meandering scrollwork, establishes an idea, and then immediately rolls back on itself like a snake, then stretches out again like an untrimmed grapevine. This imaginative scrollwork, in keeping with the Art Nouveau style, inspired the piece as a whole and required endless tinkering to design and execute. 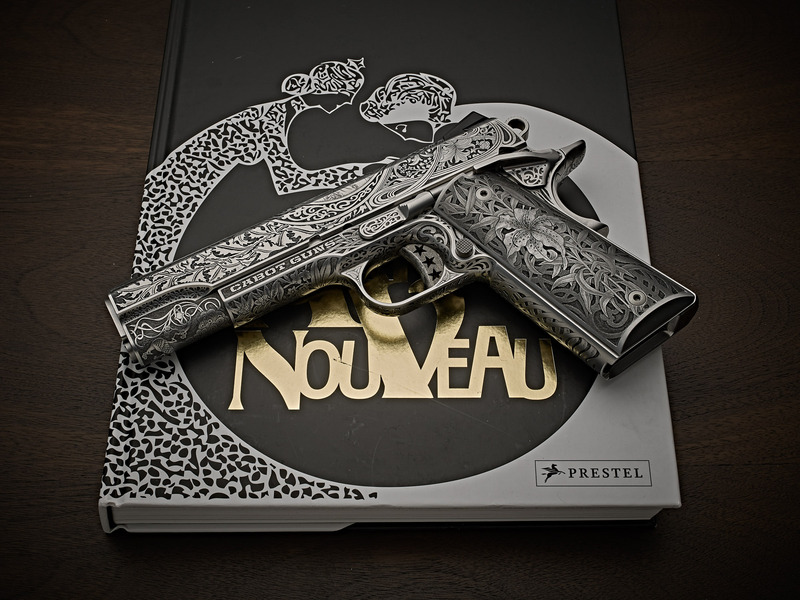 The three-dimensional engraving design of Le Nouveau is even more impressive when handling a pistol. While difficult to execute it also opens up unique design opportunities. Unlike a painting, it’s impossible to see this entire design of Le Nouveau, with all of its variations, stretched out in front of you. But precisely because of that, the Cabot Le Nouveau 1911 keeps surprising you.